If you are looking for a way to incorporate electronics into your homeschool for your 7-12 year old, then I have a treat for you! EEME is a company that makes hands-on projects and FREE online lessons to teach kids electronics. This program is created to foster their curiosity for how things work and prep them for the STEM opps of tomorrow. Each project kit is paired with online curricula to not only show your family how to assemble the kit, but more importantly, teach them how it works. The heart of EEME is their monthly subscription program. For a low monthly cost, you receive an electronics project kit in the mail. A new kit ships every month complete with all the electronic components needed to build a new project. The breadboard, baseplate and battery pack are re-used each month, for each project. This requires the kids to break down last month's project in order to build the new project. They designed the experience this way because by breaking down last month's project, it gives the kids the opportunity to revisit what was learned and built. Also, it helps to keep the plans affordable. The Basic plan starts at $18.95 per month. 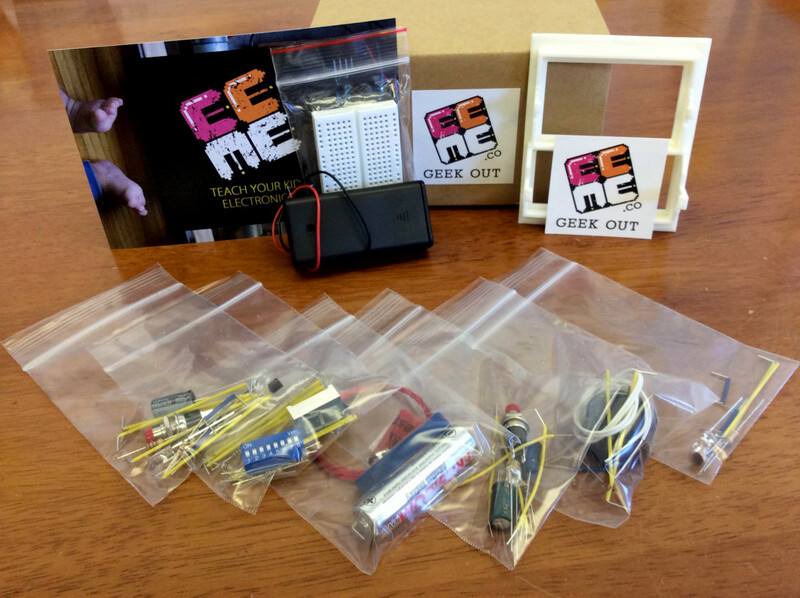 Project Genius Light is the first project in EEME's monthly project subscription. With the Genius Light project, you will assemble a simple LED circuit system that lights up when it is dark and dims when it is light. The project kit is shipped with all the materials needed to build the Genius Light (a breadboard, resistors, circuits, LEDs, battery). First, we received the kit with the items listed above. It was shipped quickly and promptly. The kit does not have written instructions included because the directions and lessons are completely online. This threw me off at first but once we got started with the online lesson, it was clear and easy to follow. The kits are designed for children ages 7-12 and I am confident that if left alone with the video lessons and kit (and minimal supervision since it is dealing with electricity,) that my third grader would be able to complete the project relatively independently. I honestly think that his passion for Lego's has prepared him to follow instructions carefully. He also is a fan of the old school version of the game, Battleship. We have played this game often over the past few years to help him gain confidence in understanding grids and graphs. I am convinced that children really do learn from "play" and that it helps to prepare them for real life. Now that he is older, he is seeing through experiences like this electronics kit that there is an actual, practical use for his skills gained. Reading the breadboard is similar to the game battleship so, not only did he catch on quickly but he enjoyed the project too! My younger son enjoyed the project just as much as his older brother although guidance was needed. He picked up on the terms and questions asked throughout the lesson quickly and seemed to absorb the material like a sponge. He already was familiar with some of the concepts taught such as the negative and positive charge on a battery so once that got his attention he was readily able to learn the new material presented. We also let our daughter who is a rising kindergartner join in on the lessons. Her attention was not kept for very long but she enjoyed it when we allowed her to participate in the hands-on activities! Before we made the actual dimming light, they were taught the basics of how the LED light worked. The lesson had several short videos, only a few minutes long with simple questions afterwards for the students to both dictate to the parent and enter in on the computer. Here, they learned how and why the LED light was able to light up. Once they learned the basics they were able to get on with the final project, the Genius Light! They followed the instructions carefully and were able to successfully make a working light that dims! At first I thought this project might be too advanced for their first electronics project, but they ended up catching on quickly. The video lesson is key though in helping them to not only learn how to put the kit together but in understand the why's in how it works. This project is estimated to take between 1.5 -2.5 hours. It took us closer to 1.5 hours to complete. My kids, the boys especially thoroughly enjoyed this project. It allowed them to use previous skills gained to learn something new and it allowed them to create something practical and useful. Children are always asking why and how things work and this project provided them with the insight and know how to learn more about the world around them. Electricity can be both amazing and dangerous and I appreciate how this lesson made that clear to the students. It is not something to be played around with but the children were able to learn how to put the parts together properly in a useful and responsible way. This lesson helped teach them responsibility and helped them gain confidence that they will need in the real world. If you don't want to sign up for the monthly subscription, EEME has a Six Project Set that you can order instead! This set has over 80 components and wires to build 6 projects from night light circuits to alarm circuits to countdown circuits. At the end of the 6 projects, you will have learned about all the fundamentals of electronics; LEDs, resistors, capacitors, transistors, voltage, current, and much much more. The Six Project Set is similar to subscribing to the Basic Plan for 6 months but it is better suited for families who rather get all the projects at once and not have to deal with subscriptions and monthly charges. Disclaimer: Thanks to EEME for providing me with the above kit for the purpose of this review.